The most complete and innovative range of oil free piston compressors on the market with motor size from 0,25 Hp up to 14 Hp. 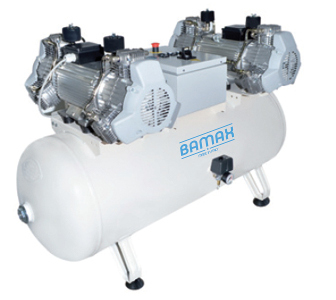 Silent operations, efficiency, heavy duty cycle use and operating pressure up to 10 BAR are just some of the important points making these compressors a reference in the oil free compressors world. Our new innovative membrane dryers are free of maintenance and can provide a dew point of - 37°C. Together with a double filtration system till 0.01 micron can offer the best quality of air for patient health and for the best utilisation of the medical equipments. In case it is required our range offers a noise level as low as 55 decibels.